IN CASE OF ACIDENTE BREAK THIS RECORD is the first ACIDENTE's new phase record. All Instrumental, it has great songs where creative arrangements bring to different moods. Mala: "IN CASE OF ACCIDENT...BREAK THIS RECORD is a title which lenght may look pretending. As a matter of fact the album sounds quite interesting, once it's an 8-channel, analog recording, produced beneath the underbroke, released only in vinyl when CD already ruled - and yet great fans of the band claim it as being ACIDENTE's best record." This first appearance of instrumental, prog-driven NEW AÇA was developed and recorded under a fair, almost magic atmosphere which helped to overcome all difficulties. It was as well ACIDENTE's last analog production, waving goodbye to old-fashioned, stylish, majestic 8-channel Sono Viso. Soon after the album was released (December 1989, bearing 1990 on label "to not get old"), all we knew that we had done a great job. Some stations airplayed new ACIDENTE and we were told of good critics, even from abroad. Press opened space for the band's work. In late 1990. Read the article written by Paulo Malária. ACIDENTE is back once more and a new album should be expected soon! The name ACIDENTE refers to 2 different bands in time, each one with its one style and mood. Founded 1978 by Journalism students, first ACIDENTE was much for blues and basic rock. It lasted 9 years, featured an amount of ever-changing moods and found its place in the indie rock scene of the early 80s - but, as many others, got smashed when a small amount of pop-rock groups sponsored by major labels took off all spaces. In 1987, original ACIDENTE disbanded leaving 31 tracks into 3 records, none available so far and worlds away from prog music at all. Through the next 2 years ACIDENTE remained only as a trademark and piles of unsold vinyls. Then, in mid1989, keyboardist/producer PAULO MALÁRIA formed a new studio band to compose and record instrumental progressive rock, without live acts. Joined the project guitarist ZUNGA EZZAET, bassist JARBAS LOOP and drummer BRUNO MEGA. As rehearsals developed, it was suggested that the new group could as well be named ACIDENTE, idea that found no opposition. This album, called '(Em caso de Acidente...) Quebre Este Disco', was recorded during late 1989 at an old-fashioned analog, 8-channel studio in an atmosphere of intense enthusiasm that would transcend all hurdles. By the beginning of 1990 this second ACIDENTE's debut album was released. Yet still an LP, it got a surprisingly nice reception. This achievement allowed ACIDENTE to get acquainted by prog fans, leading the band's name beyond our greatest expectations. Thanks to producer Leonardo Nahoum and his Rock Symphony label, Quebre Este Disco is finally available on CD. Original sound was enhanced after thoroughful remastering. Bonus tracks reflect the group's following steps. 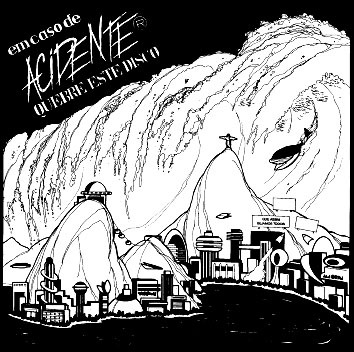 In 1992, when ACIDENTE restarted sessions to record Gloomland, their first CD and digital recording at their 'home studio' 806, Bruno had quit drums for computers, being replaced by MARIO COSTA. Taken from this album is track 14, originally with lyrics. Track 15 was produced in 1994, soon after Gloomland's release, and has been unavailable up to now. It features as guest lead vocalist HELIO 'Scubi' JENNÉ, one of the 1978's pioneer and member during all the group's 1st phase. It took no long until Jarbas traded rock by gospel and the bass passed to ARY MENEZES, who already worked with ACIDENTE as sound engineer Paulinho Padilha's assistant. From Farawayers', their 1996 CD (latest to the moment), is track 16, added with lyrics as it was in its 1981 first recording. 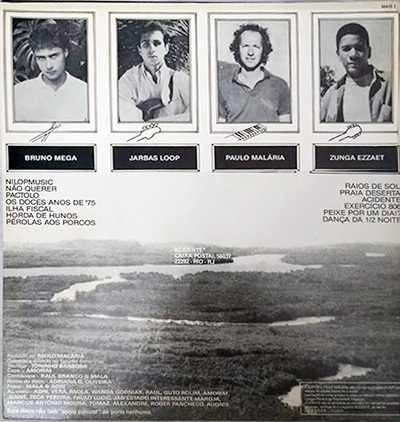 Finally, having Zunga moved to a distant place, the 2000 remaining trio (Mário - Ary - Malária) prepared tracks 17 & 18 as special bonus gifts to this very welcome issue. ACIDENTE is back once more and a new album should be expected soon! Thaks to: Adri, Vera, Paola, Wanda Gorniak, Raul, Guto Rolim, Amorim, Jenné, Zeca Pereira, Paulo Lucic, Jad'Estado Interessante Maroja, Audnis.